NONESUCH, a student newsletter at Pine Mountain Settlement School was published only once, in December of 1939. It takes its name from the four-couple English folk dance of the same name that is described in Playford’s The English Dance Master (1652 and in the 2nd and 3rd editions of the same) and in Cecil Sharp’s Country Dance Book II (1911). 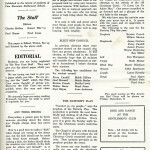 The newsletter was initiated by students at the school as an alternative to the Pine Cone, the established newsletter of the school. Nonesuch had a very short run but it was one of the more interesting publications of the boarding school years. Spawned by student discontent with the current elected student officers and the publication, Pine Cone, the one-time Nonesuch publication sought to give an alternative voice to student views that some perceived as not being heard or acknowledged. 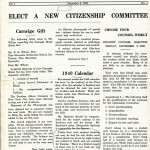 The publication appeared to have some support from the administration and by members of the “Citizenship Committee,” the student disciplinary body of the school, as it was printed through the campus printing press. 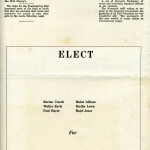 The publication had four editors: Charles Hollins, Robert Blanton, Paul Hayes, and Fred Jones. Of the students editors who wrote, edited, set up the printing, and printed the publication, one editor, Paul Hayes, is of particular later interest. Paul came back to the school some forty years later to serve as director of the institution. While the publication captures the youthful discontent of a few students, it is more telling as a barometer of student involvement and the heartfelt concern for the school that many students felt and vocalized. How the school might better serve the needs of its students was not just an administrative concern. Caught up in a world at war and a rapidly developing industrialization of the surrounding region, the growing discontent with “the status quo,” was both local and national. The students vowed to give a kick-start to enthusiasm for self-governance and for the student government process as a necessary tool for working through change. Students, you are being neglected by The Pine Cone Staff. They can’t give you the school paper which you deserve. We are trying our best to give you a paper which you like. We are giving you the “stuff” which the Pine Cone never thought of giving you. Moreover the Pine Cone can never publish news like ours and claim originality. …. We sincerely hope you enjoy reading Nonesuch, because we want to print it regularly for you. Everywhere a person goes he hears someone growling about the status quo. People always bray but never kick. Now is a good time to make a “kick” when things are wrong in the status quo, but the kick should not be made with blind brute strength. Before making a kick, the kicker should think his vexation over carefully. Is the kick good for others and himself? Is it being made to help someone, or is it one of those frequent unjust personal grudges that nearly everyone has at one time or another? If it is for the better, then preparation for the delivering the kick effectively should be made. First ask some questions and get ideas of other people. Next, build up a defense that contains clear points. Get backers. Discuss it pro and con with any number of people and convert them to the proposed kick by using new honest-to-goodness reasons. With backers, which may be few or many, an approach can be made to the ones who can bring about or help bring about the change wanted. It is easy to talk and growl about some things, most people do that. But it takes hard work done well to stop braying; kick sensibly. Original and copies of the publication in file folders in filing cabinet in the Pine Mountain archives. 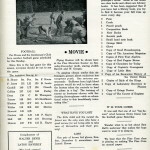 Nonesuch is a student newsletter at Pine Mountain Settlement School was published only once, in December of 1939. Spawned by student discontent with the current elected student officers and the publication, Pine Cone, the one-time Nonesuch publication sought to give an alternative voice to student views that some perceived as not being heard or acknowledged.